The Northwest Ordinance (formally An Ordinance for the Government of the Territory of the United States, North-West of the River Ohio, and also known as the Freedom Ordinance or "The Ordinance of 1787") was an act of the Congress of the Confederation of the United States, passed July 13, 1787. 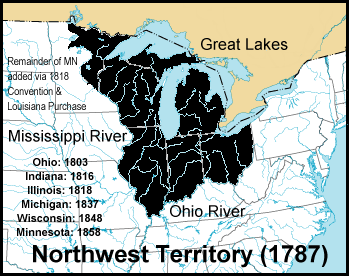 The primary effect of the ordinance was the creation of the Northwest Territory, the first organized territory of the United States, from lands south of the Great Lakes, north and west of the Ohio River, and east of the Mississippi River. On August 7, 1789, President George Washington signed the Northwest Ordinance of 1789 into law after the newly created U.S. Congress reaffirmed the Ordinance with slight modifications under the Constitution. The Ordinance purported to be not merely legislation that could later be amended by Congress, but rather "the following articles shall be considered as Articles of compact between the original States and the people and states in the said territory, and forever remain unalterable, unless by common consent...."
Arguably the single most important piece of legislation passed by members of the earlier Continental Congresses other than the Declaration of Independence, it established the precedent by which the federal government would be sovereign and expand westward across North America with the admission of new states, rather than with the expansion of existing states and their established sovereignty under the Articles of Confederation. It is the most important legislation that Congress has passed with regard to American public domain lands. The U.S. Supreme Court recognized the authority of the Northwest Ordinance of 1789 within the applicable Northwest Territory as constitutional in Strader v. Graham, 51 U.S. 82, 96, 97 (1851), but did not extend the Ordinance to cover the respective states once they were admitted to the Union. The prohibition of slavery in the territory had the practical effect of establishing the Ohio River as the boundary between free and slave territory in the region between the Appalachian Mountains and the Mississippi River. This division helped set the stage for national competition over admitting free and slave states, the basis of a critical question in American politics in the 19th century until the Civil War. Since earliest times, rivers have been the arteries of inland travel, and the history of exploration in North America has been based in its waterways. Having been excluded from known sea routes to the orient, which were based in European trade, the early French and British explorers in the area searched for the mythic water route known as the Northwest Passage through North America to the Pacific Ocean. English settlement was concentrated along the Atlantic coast; the French established dominance over the inland areas around the Great Lakes and major rivers, with the help of native Indian knowledge. From 1660 to 1670, French Jesuit missionaries extended into the new territory, with establishments at Sault Ste. Marie and Green Bay. In 1673, Father Marquette and explorer Joliet traveled south on Lake Michigan to Green Bay, crossed the divide of the Fox into the Wisconsin and reached the Mississippi River, from where they continued southward passing the confluence of the Pekistanoui from the west, the Ohio from the east, and until noting signs of Spanish influence from the south. This exploration largely defined the known limits of the Northwest Territories. Between 1673 and 1684 La Salle opened another water route from the St. Lawrence River, through the Niagara and the Great Lakes and across the Chicago portage to the Mississippi. In what became known as Illinois Country, he founded forts on the St. Joseph River in Michigan, and on the Illinois River and farther south. LaSalle understood the meaning of the crossing paths of French and Spanish exploration from opposite directions, and outlined the main lines of future French strategy in North America; he recognized the Mississippi as the key to control of the vast continental heartland, and the Ohio River became the line beyond which they would attempt to bar British expansion from the east. This lasted for nearly a hundred years under French colonial rule and another twenty under the British. During this time, the waterways were the transportation and trading routes which yielded the inland's vast riches; they were both a source of European rivalry and the object of future American developmental desire. The territories northwest and southwest of the Ohio River are depicted on this map of the early United States (1783–1803). The territory was acquired by Great Britain from France following victory in the Seven Years War and the 1763 Treaty of Paris. Great Britain took over the Ohio Country, as its eastern portion was known, but a few months later closed it to new European settlement by the Royal Proclamation of 1763. The Crown tried to restrict settlement of the thirteen colonies between the Appalachians and the Atlantic, which raised colonial tensions among those who wanted to move west. With the colonials' victory in the American Revolutionary War and signing of the 1783 Treaty of Paris, the United States claimed the territory, as well as the areas south of the Ohio. The territories were subject to overlapping and conflicting claims of the states of Massachusetts, Connecticut, New York, and Virginia dating from their colonial past. The British were active in some of the border area until after the Louisiana Purchase and the War of 1812. The region had long been desired for expansion by colonists. The states were encouraged to settle their claims by the US government's de facto opening of the area to settlement following the defeat of Great Britain. In 1784, Thomas Jefferson, a delegate from Virginia, proposed that the states should relinquish their particular claims to all the territory west of the Appalachians, and the area should be divided into new states of the Union. Jefferson's proposal to create a federal domain through state cessions of western lands was derived from earlier proposals dating back to 1776 and debates about the Articles of Confederation. Jefferson proposed creating seventeen roughly rectangular states from the territory, and suggested names for the new states, including Chersonesus, Sylvania, Assenisipia, Metropotamia, Polypotamia, Pelisipia, Saratoga, Washington, Michigania and Illinoia. The Congress of the Confederation modified the proposal, passing it as the Land Ordinance of 1784. This ordinance established the example that would become the basis for the Northwest Ordinance three years later. Michigan, Illinois, and Washington were eventually adopted as new state names. The 1784 ordinance was criticized by George Washington in 1785 and James Monroe in 1786. Monroe convinced Congress to reconsider the proposed state boundaries; a review committee recommended repealing that part of the ordinance. Other politicians questioned the 1784 ordinance's plan for organizing governments in new states, and worried that the new states' relatively small sizes would undermine the original states' power in Congress. Other events such as the reluctance of states south of the Ohio River to cede their western claims resulted in a narrowed geographic focus. When passed in New York in 1787, the Northwest Ordinance showed the influence of Jefferson. It called for dividing the territory into gridded townships, so that once the lands were surveyed, they could be sold to individuals and speculative land companies. This would provide both a new source of federal government revenue and an orderly pattern for future settlement. The passage of the ordinance, which ceded all unsettled lands to the federal government and established the public domain, followed the relinquishing of all such claims over the territory by the states. These territories were to be administered directly by Congress, with the intent of their eventual admission as newly created states. The legislation was revolutionary in that it established the precedent for new lands to be administered by the central government, albeit temporarily, rather than under the jurisdiction of the individually sovereign original states, as it was with the Articles of Confederation. The legislation also broke colonial precedent by defining future use of the natural navigation, transportation and communication routes; it did so in a way that anticipated future acquisitions beyond the Northwest Territories, and established federal policy. Article 4 states: "The navigable waters leading into the Mississippi and St. Lawrence, and the carrying places between the same, shall be common highways and forever free, as well to the inhabitants of the said territory as to the citizens of the United States, and those of any other States that may be admitted into the confederacy, without any tax, impost, or duty therefor." The most significant intended purpose of this legislation was its mandate for the creation of new states from the region, once a population of 60,000 had been achieved within a particular territory. The actual legal mechanism of the admission of new states was established in the Enabling Act of 1802. The first state created from the Northwest Territory was Ohio, in 1803, at which time the remainder was renamed Indiana Territory. The other four states were Indiana, Illinois, Michigan, and Wisconsin. A significant portion (about 1/3) of Minnesota was also part of the territory. As an organic act, the ordinance created a civil government in the territory under the direct jurisdiction of the Congress. The ordinance was thus the prototype for the subsequent organic acts that created organized territories during the westward expansion of the United States. It specifically provided for the appointment by Congress of a Territorial Governor with a three-year term, a Territorial Secretary with a four-year term, and three Judges, with no set limit to their term. As soon as there was a population of 5,000 "free male inhabitants of full age", they could form a general assembly for a legislature. In 1789, the U.S. Congress made minor changes, such that the President, with the advice and consent of the U.S. Senate, had the power to appoint and remove the Governor and officers of the territory instead of Congress. The Territorial Secretary was authorized to act for the Governor, if he died, was absent, was removed, or resigned from office. The Natural Rights provisions of the ordinance foreshadowed the Bill of Rights, the first ten amendments to the U.S. Constitution. Many of the concepts and guarantees of the Ordinance of 1787 were incorporated in the U.S. Constitution and the Bill of Rights. In the Northwest Territory, various legal and property rights were enshrined, religious tolerance was proclaimed, and it was enunciated that since "Religion, morality, and knowledge, being necessary to good government and the happiness of mankind, schools and the means of education shall forever be encouraged." The right of habeas corpus was written into the charter, as was freedom of religious worship and bans on excessive fines and cruel and unusual punishment. Trial by jury and a ban on ex post facto laws were also rights recognized. "There shall be neither slavery nor involuntary servitude in the said territory." The language of the ordinance prohibits slavery, but it did not emancipate the slaves already held by settlers in the territory. Efforts in the 1820s by pro-slavery forces to legalize slavery in the territory failed, but an "indentured servant" law allowed some slaveholders to bring slaves under that status; they could not be bought or sold. Southern states voted for the law because they did not want to compete with the territory over tobacco as a commodity crop; it was so labor intensive that it was grown profitably only with slave labor. The balance of the number of free versus slave states was not affected, as most slave states in 1790 were south of the Ohio River. Article VI required residents to return fugitive slaves to their owners. This provided slave owners with previously unprecedented federal support. The Northwest Ordinance, along with the Land Ordinance of 1785, laid the legal and cultural groundwork for midwestern (and subsequently, western) development. Significantly, the free state legal philosophies of both Abraham Lincoln and Salmon P. Chase (Chief Justice, Senator, and early Ohio law author) were derived from the Northwest Ordinance. The utmost good faith shall always be observed towards the Indians; their lands and property shall never be taken from them without their consent; and, in their property, rights, and liberty, they shall never be invaded or disturbed, unless in just and lawful wars authorized by Congress; but laws founded in justice and humanity, shall from time to time be made for preventing wrongs being done to them, and for preserving peace and friendship with them. ...the governor shall make proper divisions thereof... to lay out the parts of the district in which the Indian titles shall have been extinguished, into counties and townships. Many Native Americans in Ohio, who were not parties, refused to acknowledge treaties signed after the Revolutionary War that ceded lands north of the Ohio River inhabited by them to the United States. In a conflict sometimes known as the Northwest Indian War, Blue Jacket of the Shawnees and Little Turtle of the Miamis formed a confederation to stop white expropriation of the territory. After the Indian confederation had killed more than 800 soldiers in two battles — the worst defeats ever suffered by the U.S. at the hands of the Indians — President Washington assigned General Anthony Wayne command of a new army, which eventually defeated the confederation and thus allowed European-Americans to continue settling the territory. ↑ Story, Joseph. Commentaries on the Constitution of the United States: with a preliminary review of the constitutional history of the colonies and states before the adoption of the Constitution, p. 228 n. 1 (Little, Brown, 1873): “One party could not change or absolve itself from the obligation to obey them”. ↑ 5.0 5.1 Hubbard, Bill, Jr. (2009). American Boundaries: the Nation, the States, the Rectangular Survey. University of Chicago Press. pp. 46–47, 114. ISBN 978-0-226-35591-7. ↑ "Report from the Committee for the Western Territory to the United States Congress". Envisaging the West: Thomas Jefferson and the Roots of Lewis and Clark. University of Nebraska–Lincoln and University of Virginia. March 1, 1784. http://jeffersonswest.unl.edu/archive/view_doc.php?id=jef.00155. Retrieved August 19, 2013. ↑ Chardavoyne, David G. (2006). "The Northwest Ordinance and Michigan's Territorial Heritage". In Finkelman, Paul; Hershock, Martin J.. The history of Michigan law. Ohio University Press series on law, society, and politics in the Midwest. Athens, Ohio: Ohio University Press. ISBN 978-0-8214-1661-7. OCLC 65205057. http://books.google.com/books?id=jjSD45-P2_YC&lpg=PP1&pg=PA13#v=onepage&q&f=false. Retrieved November 30, 2010. "Its provisions established a structure of government that encouraged settlement of that vast region and provided those settlers a startling set of civil rights that presaged the U.S. Constitution's Bill of Rights"
↑ Northwest Ordinance - 1787: An Ordinance for the government of the Territory of the United States northwest of the River Ohio. Retrieve December 12, 2010. "Ordinance of 1787". New International Encyclopedia. 1905.